Dr. Collins and Dr. Montz take pride in providing patients with a comprehensive menu of dental services, including leading-edge options like dental implants that aren’t available in just any general practice. Dental implants are the ideal replacement for missing teeth because they mimic nature to a seamless degree, restoring your natural dental structure and preserving your oral health with long-term success. If you’re missing one or more teeth, contact Collins & Montz Dentistry in Melbourne Beach, FL to schedule your first consultation. Our team looks forward to welcoming you! Your tooth has two equally important components – the white crown that shows when you smile, and the root safely hidden beneath the jawbone. 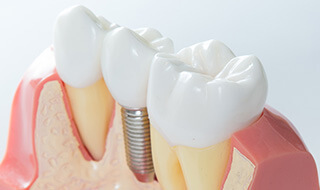 While most tooth replacement options only bother with the first part of that equation, dental implants actually consist of a small titanium post that’s inserted into the jawbone, effectively replacing the tooth root in order to preserve jawbone health and provide a sturdy foundation for the eventual replacement crown. This prevents bone deterioration, bolsters your oral health, and creates a seamlessly lifelike result that’s virtually indistinguishable from the rest of your smile. You’ll need to attend an initial consultation at Collins & Montz Dentistry, during which our team will determine whether or not your personal situation and oral health are right for dental implant treatment. If you’re deemed a good candidate, your new implant(s) will need to be surgically inserted into the jawbone. Unlike many other general dentists in the Melbourne Beach area, our team can perform this procedure right here in-office for maximum convenience and comfort. A months-long healing process will take place, during which your new implants will form a gradual, long-lasting bond with your natural tissue and bone. Finally, patients will return to our office so that we can design and place high-quality, tooth-colored restorations over the placed implants. Multiple options are available for restoration, including all-ceramic dental crowns for individual teeth and implant-retained bridges or dentures that can effectively cover several teeth at once. In addition to the traditional implant process, patients who are suffering from the loss of teeth along their full bottom arch, top arch, or all through their mouth can find fast relief with the All-On-4 procedure. Just like the name implies, All-On-4 will consist of four implants that are strategically placed within the jawbone so as to prevent the need for time-consuming grafts. Then, a customized prosthetic is anchored in place immediately following the implant placement – no waiting required! After your gums have had time to properly heal, patients will return to our Melbourne Beach location so that we can replace their temporary restoration with a better-fitting, permanent model.